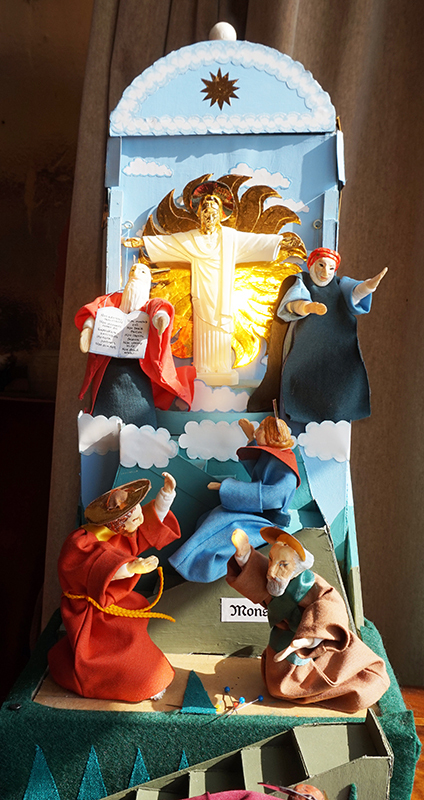 In one way this is a simpler problem, reflection-wise, than the Nativity star. Christ goes up the mountain with three Apostles and is transfigured before them (Matthew 17:2): his face did shine as the sun: and his garments became white as snow. Various French stage directions give instructions for this (see my article). He puts on a gilded mask and gloves (Jean Michel Mistere de la Passion), and could be wearing the white garments under his traditional dark red gown. Michel also suggests that he should be standing in front of a vng grant soleil a rays bruny, 'a great sun with polished rays'. 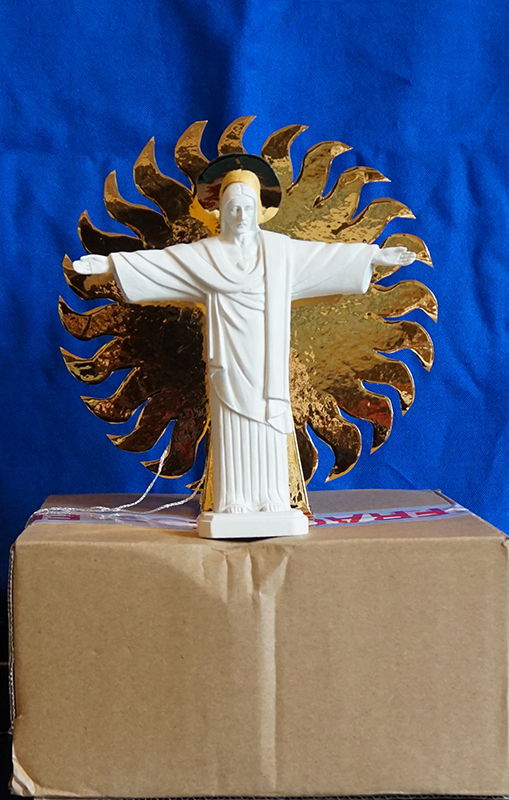 In my model the sun is made to rise behind Christ by a winch. All this would pick up even ambient daylight, but for a really dazzling effect (It marres my might, I may not see  York 23:87), you could use a supplementary reflection. The stage directions from Revello (c.1490) suggests a polished [brass] basin. 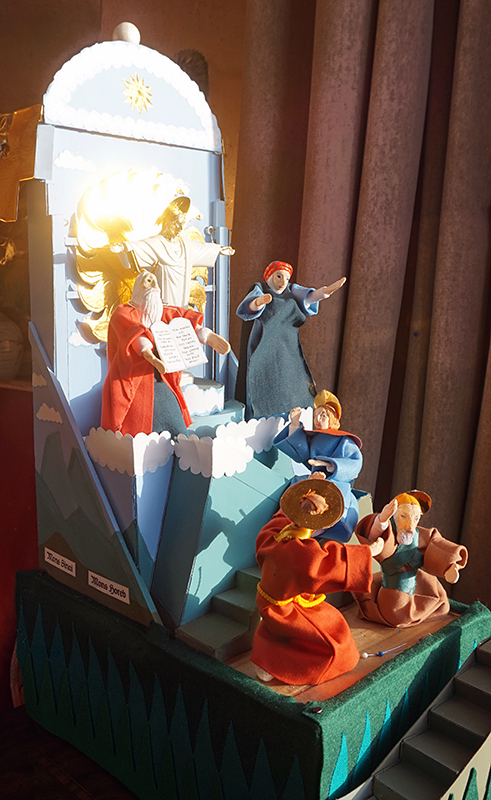 The principle is the same as in the spotlight in the Nativity. The special effects are not over, however. After the appearances of Moses and Elijah, a shining cloud descends and conceals Him and them. The voice of God speaks out of the cloud, and when it lifts again, everything is back to normal; the brightness has vanished, and so have Moses and Elijah. (1). 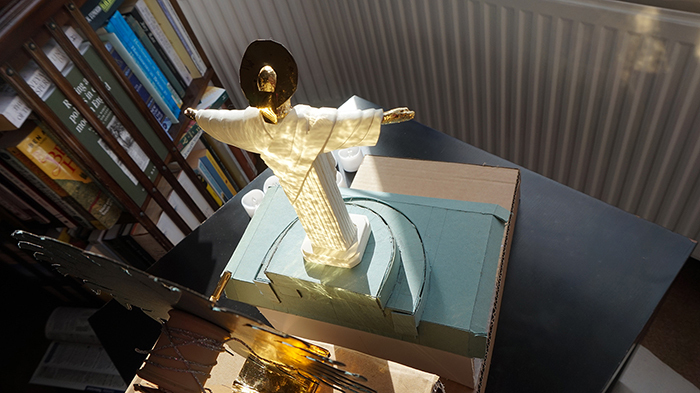 Early stages: Christ figure without gilded face and hands but with halo and before a golden (Fablon) sun. (2). With gilded face and hands on an early stage of the set, without backing sun. (3). 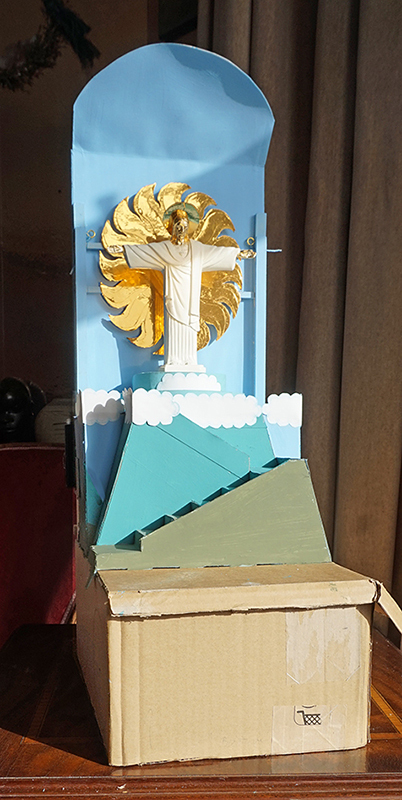 Next stage: with gilded face and backing sun. (4). 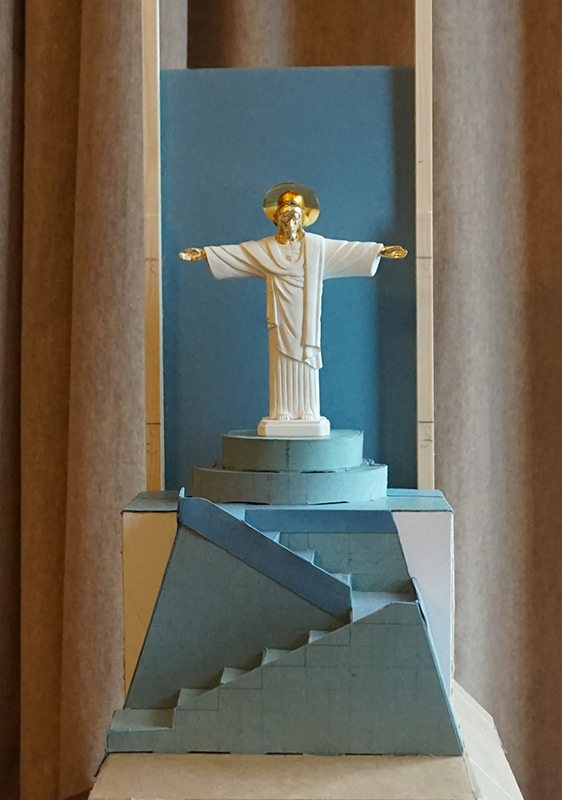 From above and behind: full sunlight slightly slantwise, reflection from sun onto Christ's back. Notice reflection projected on radiator. (5). Full set. General ambient light sideways through window. (6). Spotlight directed at Christ. It is difficult to give the full effect, as the camera does its best to compensate. The beam has been directed rather low. (7). This sideways-on version probably gives the best idea. (8). The great surprise was that the cloud, which was made out of gathered gold lamé, reflected almost as much as the sun. It rises up, swivels round from the back, and descends. The next stage is that the blind drops and the cloud conceals the upper deck from sight.